Astrid of Paulchens FoodBlog blog is the host for Bread Baking Day #48. Bread with Eggs is the task she has given us. The first thing that came to my mind was Dutch Easter Bread because it holds a hardboiled egg. 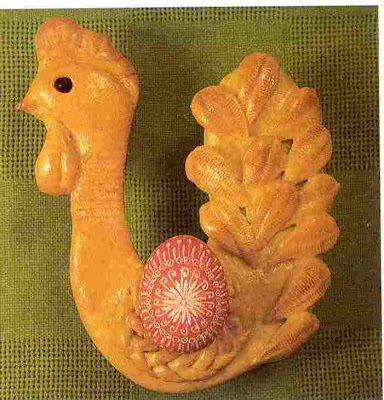 When Peter and I were young we would have chicken shaped bread with a hardboiled egg in its belly for Easter breakfast. Peter’s father was a confectioner in his younger years. He was an artist and could shape the most beautiful marzipan and chocolate figures. People would come from all over the region to buy them. Even though he wasn’t a baker, he baked great Easter chicken as Peter recalls. Here’s an example I found at the Dutch Bakery Museum. was a treat for us. I can bake nice sourdough bread, but I’m not an artist when it comes to shaping bread. But, I like a challenge and decided it‘s time to try to braid a Challah from my growing list of breads to bake. Most people will be surprised to read I’ve never eaten a Challah. When we lived in the Netherlands I never saw a Challah in the bakery shops. Typing this means I baked the Challah and succeeded. Making the dough was the easy part. I found a recipe with video at FineCooking, both by Maggie Glezer. I couldn’t have made the 6 strand braid without her excellent explanation. Off course I went for the 6 strand braid; I like a challenge. But, I must be honest. I started braiding and after a short while I called Peter to help me. We worked together and near the end we were lost and had to start over. This was a pity because it looked perfect. We un-braided the loaf and this time Peter braided alone. It went much better this time, Peter stayed focused on braiding. Although it’s not perfect yet, we are very happy with the result. Especially because it’s the first one we made. Even though I followed the recipe to the letter, I had to give it something extra. Instead of honey I added homemade ginger syrup. After eating this soft and full flavor bread, I know it’s not the last time. Luckily we still had my home made Strawberry jam! Now it’s on my list of bread to bake again. Both lists are growing and growing. Start with a sponge. Mix in a large bowl, the yeast with 74 grams of the flour. Add the warm water and stir. Let the sponge to puff up in about 15-to 20-minutes. Add the eggs, oil, honey, and salt; stir until well combined. The sponge will remain lumpy, this is fine. Add the remaining flour and mix the dough in the bowl until all the ingredients are combined. Turn the dough out onto a work surface and knead until fairly smooth, about 2 minutes. The dough should feel very firm and will be hard to knead. If it’s soft and sticky, add more flour until its very firm. I didn’t add enough flour and it stayed a bit tacky with the temperature in the kitchen and from my hands. Transfer the dough to a large, clean container and cover it well. Let it rise until doubled in bulk and very soft to the touch, about 2 hours, depending on the room temperature. Line an insulated baking sheet with parchment or oiled foil. If you don’t have an insulated sheet, stack two sheets together (this keeps the bottom of the bread from overbrowning during baking). I just used parchment paper and watched the loaf very closely. Now have a look at the video of Maggie showing how to braid this loaf. Turn the dough out onto a lightly floured work surface and sprinkle a little more flour over it. Spread and flatten the dough a bit, but don’t worry about punching it down. Cut it into six equal pieces. Set aside the dough pieces, cover them lightly with plastic, and brush all the flour off the work surface. Have a small bowl of water handy. Roll the 6 pieces into very thin sheets, between ½ and 1 cm thick. Don’t worry about the shape. The dough may stick to the work surface; this is all right—just nudge it gently with a dough scraper. Tightly roll up the sheet like a carpet to form a strand. Roll the strand back and forth between your hands until it’s thin, very even, and 30 – 38 cm long with pointy ends. The strand needs to grip the work surface slightly during this rolling; the “grab” will help as you roll. If the strand is too slick, very lightly dampen it with water to help it grip the work surface better. Lightly sprinkle all the strands with flour to prevent them from sticking to one another during proofing. Arrange the strands parallel to one another. At one end, gather and pinch the strands very tightly together. Weight the end with a heavy canister to keep the braid from moving and to leave your hands free, and braid closely. Follow the illustrations in the video. Lightly tap each end of the loaf with your palms to tuck it under the loaf. Let cool thoroughly on a rack. and be proud of what you’ve just accomplished. I am and we are! Wow! I think that braid looks amazing. One day I'll try something more than a 3-strand braid. And I will use that tutorial. This is such a beautiful loaf and I love the sound of your ginger syrup. Fantastic! Thanks Heather. This dough is deliciously soft, so it's fun to play with. Beautiful looking Challah. I'm curious what effect the ginger syrup had on the flavor of the bread. Do you taste it or was it just kind of in the background? I am terrible at braiding bread. It is always a struggle for me so I'm very impressed with your outcome. Thanks Ian, we are also happy with the outcome. This is a good dough to give it a try, it's soft and forgiving. As you read we had to start over when we got lost with all the strings. The flavor of ginger syrup is more in the background.It would taste nice on top of the bread, don't you think? This is a beautiful challah! what a compliment coming from you; experienced challah baker! I saw your challahs, there are so many and all beautiful.